Google+ Cinema Viewfinder: Movie Review: The Curious Case of Benjamin Button - For Your Consideration, Meet Joe Gump? Movie Review: The Curious Case of Benjamin Button - For Your Consideration, Meet Joe Gump? As Mitch Lewis, points out in a comment posted after Kenny's review, Eric Roth's screenplay even seems like an attempt to rework his own previous script for Forrest Gump. 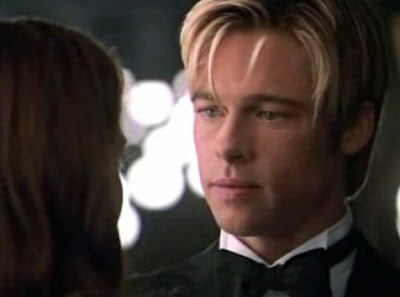 Benjamin (Brad Pitt) is a man aging in reverse, born old, getting younger over the course of the film. He falls for a childhood sweetheart, Daisy (Cate Blanchett), who he leaves behind for adventures on a tug boat in the high seas during the war. But with Fincher's usual touch of darkness, the film works to transcend those limitations. While cockeyed optimism is the flavor of Gump's outlook, Button has a melancholy pessimism enshrouding it, a certain inevitability if you will, that is haunting. Death and the respective shape it takes for each character hangs like a spectre over the film. Whether it is Daisy, on her deathbed, telling Benjamin's story in a New Orleans hospital as Hurricane Katrina rages outside; or the tugboat's Captain Mike (Jared Harris) defiantly driving his vessel into the rapid-firing shells launched by a German U-boat, Button's unasked question concerns how one faces certain death with dignity. 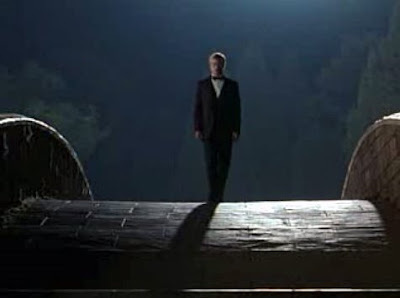 In fact, Fincher's often fog-shrouded images usually underscore the serenity of a peaceful death, echoing another iconic Pitt-starrer, Meet Joe Black (1998). Here are some examples: Like Joe Black, Benjamin is a cypher, a receptacle for all the lessons he gathers on his journeys from the many lonely travellers on their personal journeys to their end. Pitt's portrayal of Benjamin is wonderful, capturing the poignancy of old age and fusing it with the vitality of youth, in much the same way he did in Joe Black. He beautifully projects childlike wonder when he first joins the tug; at the loss of his virginity in a brothel; at the deep connection he makes with a diplomat's wife (Tilda Swinton) while on his journey. But there is a certain cover-boy quality of blankness he is also able to tap into as the youthful-looking Benjamin rapidly declines towards his cruel death, so effective in a scene where he reunites with Blanchett late into the last third of the film. Benjamin's ultimate fate, performed by a mere infant (with the help of some stunningly subtle visual effects) is most unkind to this gentle sojourner. I repeat, the visual effects are subtle. Unlike Gump's intrusive depictions of real-life figures, the magical disappearance of wrinkles on Pitt's face (and the careful preservation of his real-life scar) are easy to overlook. Similar effects of youth have been misused by lesser directors such as Brett Ratner, in the opening scene of X-Men: The Last Stand (2006). Fincher wisely uses this effect only in low-lighting situations that both add to the mood and help diminish the dissonance of the effect itself. Yes, there is the generous use of fanciful-looking CGI to create fake landscapes. But it seems to fit within the confines of the tone Fincher is trying to set with this modern fable. If the film has a fatal flaw it is that it seems a little too calculatedly mindful of Oscar. Like the Frankenstein monster that was Forrest Gump, Button sews together all the qualities that usually appeal most to the Motion Picture Academy: epic scope and length; life-spanning story; protagonist with a disability; unrequited romance; heartfelt reunions, etc. This gives the film a certain polished sheen that somehow renders it a bit hollow. But Fincher's visual artistry, and Pitt's impressive range serve to lift The Curious Case of Benjamin Button, if not to the level of a cinematic crown jewel, then at least to that of a minor gem. I'd like to see this movie partly because the gimmick appeals to me - I'm a sucker for chronology, and aging across the years, watching someone go through life against a historical backdrop (whether backwards of forwards). This partially explains my affinity for Forrest Gump, a film you and many other film buffs seem to despise, but I'll have to devote a full post to defending that film - enthusiastically on personal grounds, tentatively on formal ones as well (I think it's somewhat misunderstood) - in the future. As for Fincher, I would not count him as one of my favorite directors and kind of unfairly resent the way he has become the poster child of the clueless-yet-arrogant fanboy (you know the type) with Seven and Fight Club, both good movies, but which (especially in the latter case) strike me as being overrated. That said, Zodiac was one of the most formally impressive films of the 00s (like No Country for Old Men, it had a gorgeously composed grandeur which is rare in the age of close-ups, CGI, and fast cuts) - and one which future revisitings may render a classic.